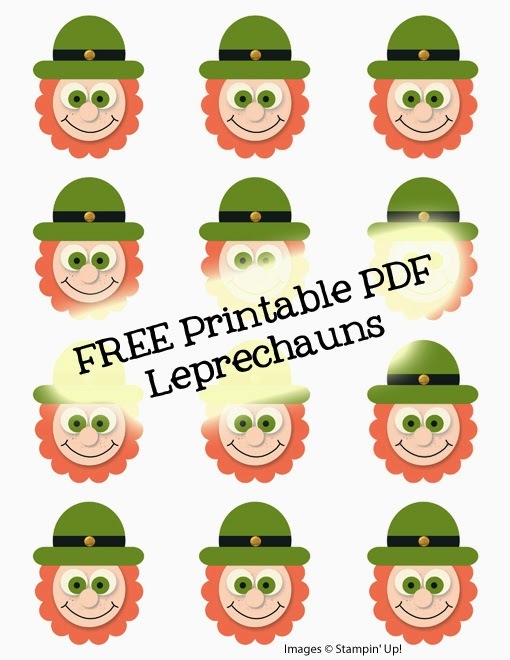 I have created a FREE printable for you, using My Digital Studio, to make my 2014 Leprechaun Punch Art! 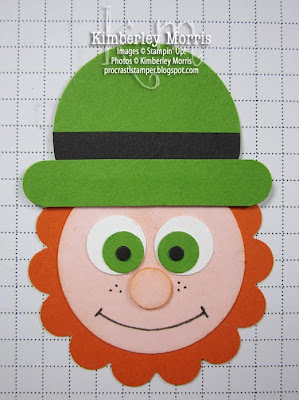 When printed at 100% (actual size), each leprechaun just fits inside the 2-1/2" Circle Punch, and can then be layered onto the 2-3/8" Scallop Circle Punch, if desired. If you want smaller leprechauns, please adjust your print scaling accordingly. 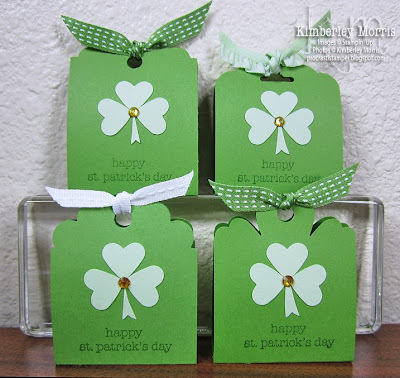 To make a quick garland, punch out scallop circles and sew them together in a line (gold thread would make a fantastic accent), then adhere a punched out leprechaun over the top of each--or use the leprechaun only every other or every few scallops. Digital Downloads Used: 1.25" Circle Punch in Blush Blossom card stock (face), Two Step Owl Punch Eyes (used for eyes and for nose), Scallop Circle Punch in Tangerine Tango (for beard), 1.25" Circle Punch in Gumball Green (cropped for hat top), 1.25" Circle Punch in Basic Black (cropped for hat band), Word Window Punch in Gumball Green (slightly flattened and stretched for hat brim), Gold Glimmer Brad, Splatter 3 in Baked Brown Sugar (reduced and rotated, then layered in for freckles), Freeform Lines for smile. Five years ago I made some Leprechaun Punch Art, but several of the supplies are now retired. I've recreated that leprechaun for you today, with supplies that are currently available to order. If you're like me, you can already envision a mini garland of leprechauns, a greeting card with a leprechaun on it, or maybe just some leprechaun cupcake picks! The ideas are as plentiful as the fabled gold at the end of the rainbow, right? I'll be back tonight, or early tomorrow morning, with a tutorial for you, but I'll list the supplies here so you can get anything you don't already have. If you are ordering St. Patrick's Day project supplies in my Online Store right now, please choose an expedited shipping option at checkout--the deadline for picking each day is 10:59am MT. If you have any problems finding the supplies or getting them ordered, email me right away. 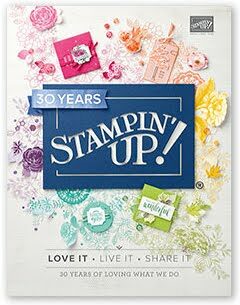 Stampin' Supplies: 1-3/8" Circle Punch, 1-3/4" Scallop Circle Punch, Owl Builder Punch, Basic Black Stampin' Write Marker, Basic Black card stock, Gumball Green card stock, Pink Pirouette card stock, Whisper White card stock, Tangerine Tango card stock, Tangerine Tango ink pad, Stampin' Sponge, Tombow Multipurpose Liquid Glue, Mini Glue Dots (optional but recommended), Paper Snips. Optional: color a Basic Rhinestone gold (using brown + yellow permanent markers) and add to center of hat band. If you see something go on sale on Tuesday, you head over to my ONLINE STORE to purchase it as soon as you can to have the best chance of getting it in stock, at the sale price. You may want to Subscribe to My Blog by Email to ensure you know which items are on sale, as soon as possible each week! NOTE: the deadline to have your order finalized for each set of Weekly Deals is 11:50pm MT each Monday night. Here is the video tutorial for making these lovely little treats...if you are receiving my blog posts in your email, you'll need to click the title of the blog post to see the video in your browser. Watch for some kitty kapers at the end of the video. No animals were harmed in the making of this movie, though they might have gotten a little discolored. Text Instructions can be found HERE. Let me know if you have any problems with my instructions, or finding any of the supplies in my ONLINE STORE. The innards of these treat holders are chocolate mints, which I found in my local "club warehouse" store. You know the one--it belongs to some guy named Sam. These super yummy treats come in these cute, shiny green individual packets, and look like a sandwich of dark chocolate bread slices, with a mint green spread in the middle. If you are using a different candy or treat in these holders, please share what works for you, and I will add it. Consider getting candy in coordinating colored wrappers, for example, green or gold wrapped candy for St. Patrick's Day. An asterisk denotes project dimension adjustments. UPDATE: Video Tutorial is HERE. Cut Gumball Green card stock to 5-1/2" x 8-1/2", then cut 5-1/2" x scant 2" strips (just less than 2") from the pieces. One sheet of 8-1/2" x 11" card stock will give you 8 treat holders. Score 2-7/16" from each short end of the card stock piece. Punch the top off each short end of the card stock. The Scalloped Tag Topper Punch allows you to punch the top and the hole at the same time. If you use any of the other punches, you will need to go back and manually create the holes for the ribbon. Alternate Punch Tops: Slide your scored card stock in the paper guide from the back of the 2-3/8" Scalloped Circle Punch, Decorative Label Punch, or my fave for St. Patrick's Day, the Blossom Punch, and cut just the very tip of each short side from the scored card stock piece. Lay your scored and punched piece flat in front of you in portrait orientation, and stamp the "happy st. patrick's day" saying from the Teeny Tiny Wishes stamp set (wood-mount , clear-mount) just above the top score line, using Gumball Green Ink Pad. Punch four hearts from Pistachio Pudding card stock, using the Small Heart Punch, and lay them above the stamped saying to judge the spacing you desire. Adhere the top heart, and one to each side of it. Remove the bottom heart. Freehand cut a stem from the bottom heart that you used for spacing, then adhere the stem. I like to use the Tombow Multipurpose Glue to adhere the heart pieces and stem. You will need a permanent yellow and a permanent brown marker for this next step. Color a medium-sized Basic Rhinestone with the brown marker and let dry for a few seconds. Dab with paper towel if you wish. Then, color over the same rhinestone with the yellow marker. This should give you a gold colored rhinestone. If it is too yellow, just color over it again in brown, and once more in yellow, to get the look you want. Using your Paper Snips, slide the tips of the barely open scissors under the self-adhesive dot under the rhinestone and lift it off the backing. Now, place the rhinestone at the center of the shamrock and press in place. Alternate Punch Tops: Go back and punch a hole on one short end. Then bend the piece at the score marks and hold the ends flush together, and punch through the hole you already made, to get the hole in the same place on the other end. Cut some ribbon to tie the treat holder closed. I cut a 3" length when using the Pistachio Pudding Ruffle Stretch Trim, or the Whisper White Stitched Grosgrain Ribbon. I cut a 4" length when using the thicker Gumball Green Stitched Satin Ribbon. Loop ribbon through both holes of the treat holder and tie in a single knot.